The collective unconscious is held within the shared stories, memories, instincts, and experiences common to all mankind. Carl Jung saw these patterns as archetypes that were manifested through dreams and behaviors. These collective shadows are influenced by ancestral experiences that shaped science, religion and morality. The throat chakra holds the stories of our collective unconscious. These stories were passed on through generations of storytellers. The throat holds the archetypal wounds of man and woman, etched in the shadow of the psyche. By shedding light on the shadowy stories held within the collective unconscious we see them for what they are. From here we can begin to rewrite the stories and shed light for others to heal. The goal is to awaken the collective unconscious to become conscious of our choices and heal these old stories to create a better world. Message: It is time for you to reclaim the wisdom that is within you. Look at the old stories of your life and see the wisdom hiding among the fears and gifts. This will help you speak your truth and share it with others from a place of peaceful power. Words spoken with love and wisdom are the most powerful gifts you can give to the world. The throat chakra is located in the throat and is connected to the vocal system. This is the place of communication, resonance and truth. It represents the lower world and the storied roots deep within the psyche of mankind. 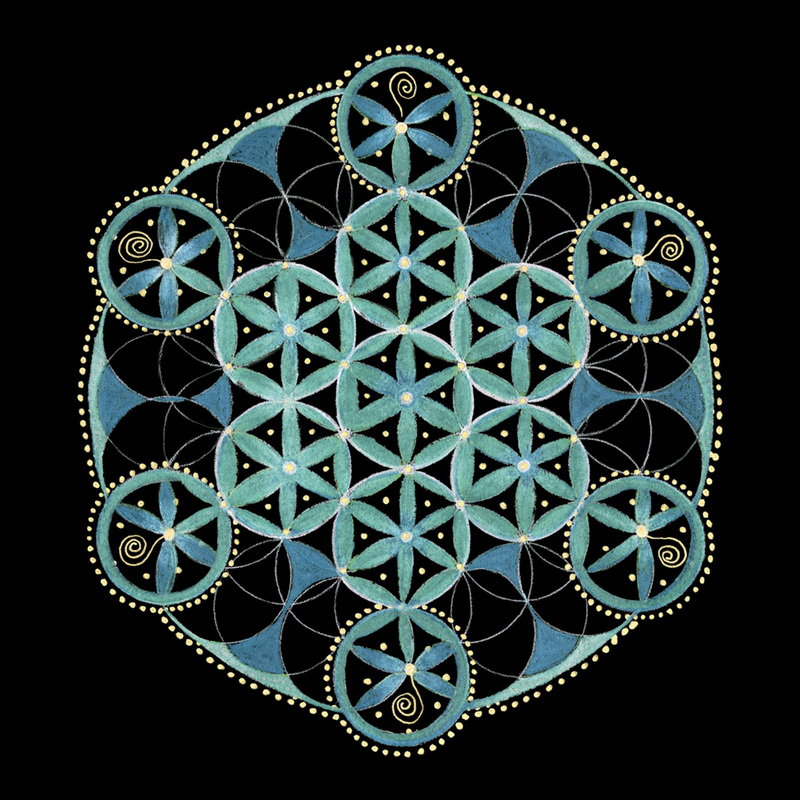 In sacred geometry, it is the fruit of life that reveals the story of time itself. Its element is air and its belief is based in Judaism where the roots of monotheism, the belief in one God, were born. The sound of wind in the trees became associated with the sound of God. These stories were passed on in the oral tradition of storytelling. They gave the story of one God a voice. The throat chakra carries these stories as archetypes held within the collective unconscious. The throat chakra reminds us to use our words and our silence wisely.